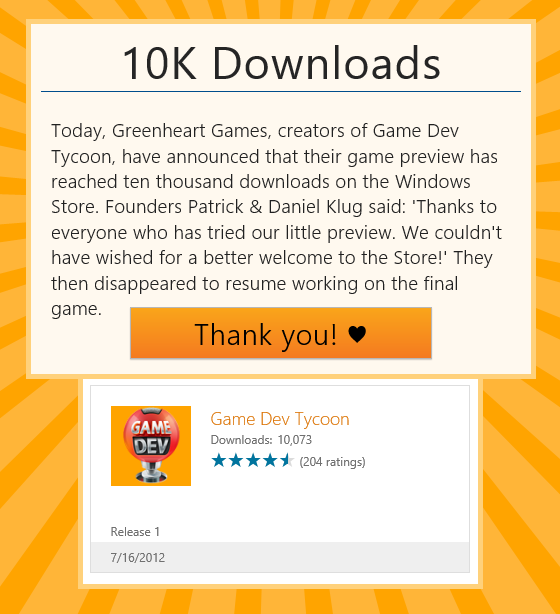 We released Game Dev Tycoon in the Windows 8 Store on 10th December 2012, so a little more than one month ago. The reception has been outstanding. We have been listed among the Top Paid apps (between positions 3 and 15, depending on the country) for the entire time and in the sorted by noteworthy category (that’s when you just click on Games directly) we are often listed as number 2 (out of 3600+ games!). We could not have wished for a better position in the Store, especially because Game Dev Tycoon has not even been featured yet! After the initial release our first players soon discovered a few bugs and before we could even start our launch celebrations we submitted the first patch to the game. The turn around for the updated game submissions to the Store have been absolutely outstanding. Most updates were accepted by Microsoft after only 12 hours! A turn around time iOS developers could surely only dream of (especially around Christmas). After a few more service updates the game is now fairly stable. We are still investigating the odd technical issues which are mostly related to auto-save errors and seem to come directly from the system. Hopefully we can work around these issues soon. To date, the full game has received 612 ratings. Most of them five stars. We have received many positive written reviews and other praise and comments on social media or via email. Not surprisingly, some players pointed out the similarities to Game Dev Story, which is another game development simulation game on the iPhone/Android and which served as the initial inspiration to Game Dev Tycoon. Most of these comments were praise saying that they really enjoyed our take on the genre but some called our game a rip-off. We respectfully disagree with the term. We have been open about our inspiration (see previous link to an interview) and said all along that our game was inspired by Game Dev Story but our entire game is our own creation – from how games are developed, to how you progress and how you make a hit game. We have created the concepts and game mechanics for Game Dev Tycoon as well as the game itself from scratch. Anyway, it’s nice to see that the majority of players who pointed out similarities made positive comments. We certainly think that players of Game Dev Story will enjoy Game Dev Tycoon and vice versa. A lot of players were eagerly awaiting the release after playing our Lite version. On the first day alone we sold 470 copies of the game. In our sub-category (Simulation games) we are definitely the top game since the average purchases were listed as five per day before we showed up. Purchase numbers of Game Dev Tycoon have since dropped considerably to around 30-50 copies a day but we hope these numbers will rise as more users discover the Windows 8 Store and as we receive more attention via reviews or (hopefully) Store highlights and promotions. To date we have had over 6000 downloads and 2300+ purchases. More than 30% of players who try our game also buy it! Indie game development is not a cheap business, especially when you live in countries with a high cost of living. We still have a long way to go before we break even on the expenses of creating the game and before we can safely focus on our next project but we have a positive outlook. It’s definitely great to see that players are liking our game. I’m glad to see that it is not only the pseudo-free social games which require you to buy virtual coins and are generally a bore to play are successful. Hopefully this will inspire some other indie devs to create more ‘traditional’ simulation games. The world could use more games which are less ville, less social, less made to generate profit but more made to be fun! Over Christmas, after we sorted out bugs in the game, we took a much needed break. We have worked on Game Dev Tycoon for over a year and in the last four months of the project we often worked seven days a week in order to finish the game before Christmas. One thing we were not able to sort out in time for the December release was support for ARM devices, specifically the Microsoft Surface. Unfortunately we face some serious performance issues on the device which make the full game unplayable in later levels. We have prepared a few test cases to try to further identify the causes of these slow downs and Microsoft seems willing to assist us with this so we are hopeful that we can resolve this some time soon. Given the nature of this problem there is no guarantee or ETA for a full RT release at this stage but as I’ve said earlier we are optimistic. We have tried to encourage feedback through links on the game Settings page, on our website, as well as on facebook and twitter. Many players have taken this opportunity to tell us what they like and what they think should be improved. From the feedback so far it is clear that many players think that the 25 in-game years are over too quickly! We plan on providing a longer game option in one of the next updates but don’t have the exact details yet. There are also other smaller things which we will attempt to adjust slightly to provide a better experience. Apart from that we currently do not plan to make any major updates or expansion packs but we definitely listen to feedback for a potential return to the game development simulation genre in the future. The full game is only available in English at the moment. We plan to provide a number of translations in the future. First, we will make the game translatable (which takes considerable effort) and then we will start with a German translation.We are both native German speakers (so it’s easy to do quality assurance) and tycoon/simulation games are quite popular in German-speaking countries. Once this first translation is available we plan to work on a process to translate the game into more languages. Many players have graciously offered their help in translating the game into their own language (thanks to all who have contacted us about this). We will have to investigate how we can do translations for the game effectively while also ensuring that the quality of the translation is right. Translating a game like Game Dev Tycoon isn’t easy so I expect that it will take a while to get the major languages under way. We plan to set up a fan forum but need to sort out some technical aspects first. In the meantime, you can connect to fellow Game Dev Tycoon fans via our Facebook page. Not surprisingly many players wonder if Game Dev Tycoon will remain a Windows 8 exclusive. We will investigate possible ports to Android (Google Play), Windows 7/Steam and maybe even the iPad once we have completed the above things. At this stage there are no promises but if you are interested in any of these or if you want to keep up to date on our plans and progress then please subscribe to our newsletter. We do not plan to port to any phone systems like WP8, iPhone or Android. Game Dev Tycoon was designed for larger screens or tablet devices and the user interface would not work on phones and would require substantial changes. As far as the feedback, ratings and reviews are concerned we had a brilliant start. We could not have wished for a better reception and would like to thank everyone who has supported us! Our newest update to Game Dev Tycoon has passed certification. Please be patient if you don’t see it straight away. It can take up to 24 hours to roll out. EDIT: The update has passed certification. Please be patient if you don’t see it straight away. It can take up to 24 hours to roll out. We have submitted a new update for Game Dev Tycoon which fixes the majority of known issues. Thanks to everyone for reporting these problems. We estimate that the update should be live in the next 2-5 days. – Fixed: ‘Find publishing deal’ would occasionally crash when all topics had been researched. – Fixed: Game crashes after researching the final 3D Graphics technology. An update to Game Dev Tycoon is now live in the Windows Store. Please be patient if you don’t see it straight away as I think it can take up to 24 hours for the update to become available. Our thanks to everyone who has submitted issues and for all your patience. We thought that we had tested the game quite thoroughly but obviously we missed a few things. Sorry for the trouble! If you have been affected by the ‘too much money’ issue and you want a pure experience it’s best to start a new game with the new update. First of all, thanks to everyone for buying the game. We don’t have the numbers yet but we certainly heard from a number of people on facebook, twitter and via email. Thank you all for your support! Thanks also for reporting issues to us. We have identified a handful of troubling issues and prepared a fix for them already. These fixes are currently in review with Microsoft and should be available in 1 to 7 days. I’m sorry if you have been affected by any of these issues. We spent a long time testing the game thoroughly but obviously we have missed a few problems. Game Dev Tycoon - Available Now! We have been very quiet lately but that’s only because we are focused on getting the game done. We have said all along that our plan is to release Game Dev Tycoon later this year and slowly but surely our time frame is closing. As it is often with software projects we are a bit overtime but we used the time well and made the game bigger and better than we initially planned. Now, after a year of hard work and some very intense months recently, Game Dev Tycoon is feature complete. Since Microsoft is the last deciding entity we can never guarantee a date but our estimate is that the game will be available for PCs and intel-based tablets later this month. For an up to date estimate you can visit our status page. Right at the moment we are testing the game extensively and tweaking some balance-related things to make sure that the difficulty is right and that different play-styles work well. We estimate to have this done this week by which point we will prepare the release and submit it to the Windows Store. When this is done we just have to wait for the game to pass submission. Usually this takes around 5 days but in case it gets rejected for some reason (which we don’t expect) it could take another 5. What features will the game have and how much will it cost? Please see the updated Game Dev Tycoon page with a lot of new information and new screenshots. The lite version is already available on ARM devices and running quite well but we are seeing some performance issues in the full game, particularly in the later level where you have many characters on screen. We are optimistic that we will be able to deliver the full game for ARM devices soon but since we currently do not know the exact cause for the issues we see we cannot tell for sure. Once the first release is out the ARM version will be our priority. If we are lucky we can solve everything before Christmas, if not it will be early next year. Once the first release has settled a bit and we have the ARM version sorted we will start to make the game translatable. There is a surprising amount of text in the full game so this will take some time to prepare. At first we will likely translate the game to German (because we are both native German speakers so this makes it easy to test) and then we will consider other languages based on demand. Last night a small bug-fix update to Game Dev Tycoon Lite went live in the Windows Store. This update is of special interest to players using the new Microsoft Surface device. We have fixed a number of performance issues which slowed down gameplay on the Surface. – Gameplay adjustment: For some games, PC sales were not strong enough compared to other platforms. – Fixed: Trashing a game does not apply experience gains. – Fixed: Rarely buttons do not respond in notification windows. – Fixed: Double clicking a button can cause the game to close. – Improved: Greatly improved overall performance on Surface. – Improved: Enhanced typewriting animation performance on Surface. – Improved: Slider and time allocation preview performance. – Improved: Skipping tutorials now skips all previously displayed tutorial messages, not just the first few. Meanwhile progress on the full game is good. We have the artwork almost wrapped up and there are only a few features to finish/polish before we can go do some extensive testing. Our plan to release it ‘later this year’ seems to hold up well. You can get the update from the Windows 8 Store. If you don’t have Windows 8 yet you should read up on it here. Until January next year Microsoft offers a fantastic upgrade offer that allows you to upgrade from Windows 7, Windows Vista and even Windows XP(!) for just under 40$. The full version of Game Dev Tycoon is still under development. We will post some new information about the full game in due course. Game Dev Tycoon Preview: 10K downloads. 200+ ratings. Thank you all for your support. Our little preview has just hit ten thousand downloads on the Windows Store and more importantly many of you have decided to give us a positive rating. We could not have wished for a better welcome! We are busy working on the final game as we are on track for a release later this year. Hopefully you won’t have to wait for too long once Windows 8 has hit shelves around the world. We will announce when the game will be available through the usual channels (newsletter, website, twitter, facebook). No, usually free games make their money by selling you virtual coins or items and often those things are required to really enjoy a game. We don’t like this approach for this type of game. Game Dev Tycoon will have a free trial similar to what the preview delivers now and the full game will have a small up-front cost. This will make sure that you can enjoy the full game without being bothered by in-app purchases or ads. By purchasing the game you will also support us and ensure that we can bring you more games in the future. Will I be able to move out of the garage? Yes, the final game will allow you to move out of the garage and into offices. Will I be able to hire employees? Yes, you will be able to hire and train employees once you own an office. Will I be able to make sequels to a game? Yes, you will be able to do that during the course of the game. Will there be more options when defining and publishing a game? Will there be random events in the game? Yes, we have added a number of events which will test your decision-making skills. There will definitely be some surprises. Will you translate the game into my language? Maybe. We do have plans to translate the game into different languages but we don’t know yet when those translations will be made available. There is a suprisingly large amount of text in the full game so a proper translation will take some time. We might release translations after the initial release.